Summary: Riley has crossed the bridge into the afterlife—a place called Here, where time is always Now. She has picked up life where she left off when she was alive, living with her parents and dog in a nice house in a nice neighborhood. When she’s summoned before The Council, she learns that the afterlife isn’t just an eternity of leisure. She’s been assigned a job, Soul Catcher, and a teacher, Bodhi, a possibly cute, seemingly nerdy boy who’s definitely hiding something. They return to earth together for Riley’s first assignment, a Radiant Boy who’s been haunting a castle in England for centuries. Many Soul Catchers have tried to get him to cross the bridge and failed. But all of that was before he met Riley . . . 3.) she can walk through walls! At School, Riley’s assigned a duty to be a Soul Catcher after having her entire life assessed by the headmasters. Her job includes helping lost souls cross the bridge into the afterlife which entails her going back to the earth plane. Too bad she’ll be in spirit form. Bodhi (a.k.a. “dork guy”) becomes her guide and will assist her on all of her missions. Riley’s first assignment is to get Radiant Boy to leave his castle which he’s been roaming for years. 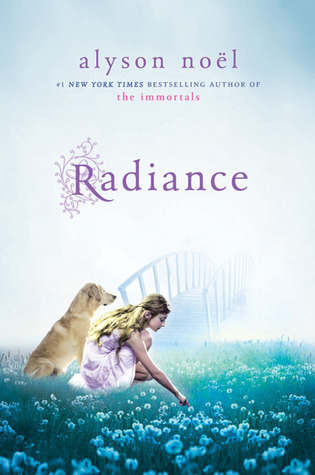 Radiant Boy is a mystery—little is known about him besides that he’s only 10 years old. Will Riley be able to accomplish her first mission—one that others have failed? Radiance By Alyson Noël is cute, fresh and at times humorous story suitable for all ages. Rating: Adored it. A total keeper. Favorite excerpt: “The weirdest thing about dying is that nothing really changed. I mean, you’d expect a really big change, right? Because dying— let’s face it, it’s prettydramatic stuff. They write songs about it, books and screenplays too. Heck, it’s even a major theme on Saturday morning cartoons. But the thing is, it’s nothing like you see on TV. Cover comment: The cover is so beautiful and mysterious and although it’s not exactly how I picture Riley to be, I think it still portrays the theme of the story well. Book source: From publisher for my honest review. The book sounds lovely. Best of luck with it, Alyson. Hmm, this does sound like a different style, but good read. Caity has already read the second book in the series and is eagerly awaiting to get her hands on a copy of the third.